The definition of a professional writer is someone who gets paid for their writing. I became a professional writer back in 1992, when an article I wrote was published in Fine Homebuilding magazine, Issue #75. The picture above is from that article (notice I once had black hair). That article was a watershed event in my life. Seeing that I had the ability to earn money by logically arranging words and ideas on paper was a powerful incentive to write more. So, I did what I always do when I want to learn something.... I bought books. There are lots of books about writing. Then, in addition to writing more for Fine Homebuilding, I decided to hone my skills (and promote my remodeling business) by writing a column for the local newspaper. Newspapers are always looking for local content, especially if it's freely offered. I sent several short, sample articles to the Features Editor. That's all there was to it. My weekly column ran for 4 months before I ran out of time to keep pursuing that idea. But it was fun while it lasted. It was definitely good marketing for my remodeling business. My first article for the local paper. These days, with the internet now being the primary go-to source for news, hardly anyone reads newspapers anymore. I know I don't. I wouldn't bother to write a column for any newspaper. I would, instead, write my own blog. And that is, in fact, what I ended up doing back in 2005 when I created The Deliberate Agrarian 1.0. Only after I had written that blog for a few months did I realize that it could help to promote the sales of my Whizbang chicken plucker plan book (and other products). I ended up utilizing the blog for marketing, as well as for sharing my "ruminations" on all kinds of other things. That blog was like a funnel. Google search engines would direct people to different blog posts. Some who came to the blog clicked on links to my products, and I made sales. It was (and continues to be) a low-key way of indirect marketing. There is now a whole business model built around the "click-funnel" approach to marketing. But, from what I've read, it's more direct and intentional than I care to be. I'm content to just blog away, discussing the things that interest me, and occasionally plugging my own products, instead of monetizing my blogs (or my YouTube channel) with outside advertising. People have told me I should monetize, but I'm just not interested in "going commercial." If marketing was my primary reason for blogging, I would, of course, avoid revealing my opinion on any contentious issue or person. For example, I wouldn't have mentioned "The War of Northern Aggression" in reference to the Civil War in a recent blog post here. Likewise, in my Deliberate Agrarian 1.0 blog, I wouldn't have posted my opinions of people like Noam Chomsky, or Phil Robertson. Or, more recently, Professor Jordan Peterson, who I've become a great admirer of. Some people just don't like the Professor. Also, if business promotion were my reason for blogging, I sure wouldn't mention my firmly rooted Christian beliefs. Sorry to say, the anti-Christian culture we now live in does not look favorably of those who identify as Christians. It's best to keep one's Christianity to oneself if you want to succeed in this economy. Funny thing... there was once a time (and not all that long ago) when Christians and Christian beliefs were held in high esteem. So, as is usual for me, I'm swimming upstream. It is, in large part, the story of my life. My point in recounting all of this is to encourage any aspiring writers who might be readers here. Every professional writer's journey is a little different, and can be instructional to others who want to achieve their own measure of success at the craft. With entrepreneurial how-to writers in mind, I've been thinking that I should write a book about how I've written and self-published how-to plan books. I've learned a few things along the way. My somewhat contrarian approach has worked. I've yet to find a book on the subject of self-publishing a plan book. Nonfiction writing books are out there, but not nonfiction focused on how-to plans. The market for such a book might be too small to justify publishing an actual, old-fashioned style of book It might have to be a PDF book. 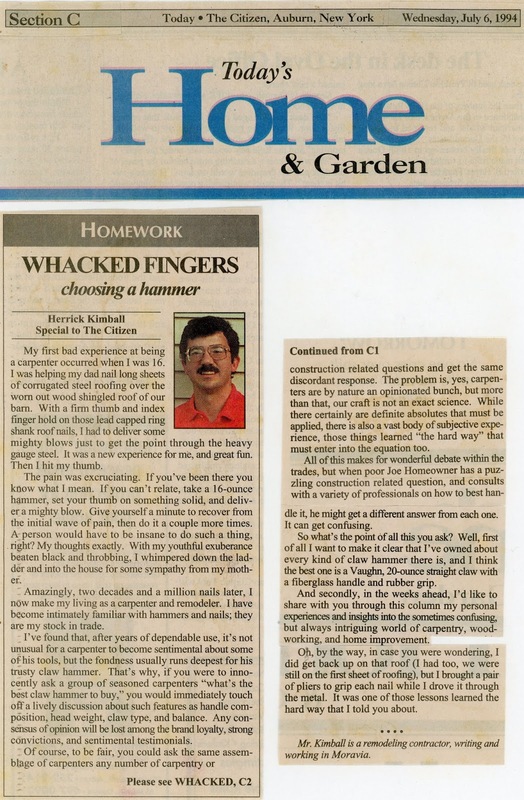 Whatever the case, before leaving this subject of writing (my early writing efforts in particular), my next blog post I will regale you with one of my newspaper articles from 1994 titled, How To Drive A Nail. I would argue that it is precisely because of your writing about things that are sometimes contentious (without actually being contentious in your writing) that you have attracted the people who want to buy the products you sell. People don't like being sold to, but they do like to buy from people they can relate to. I do try not to be contentious. 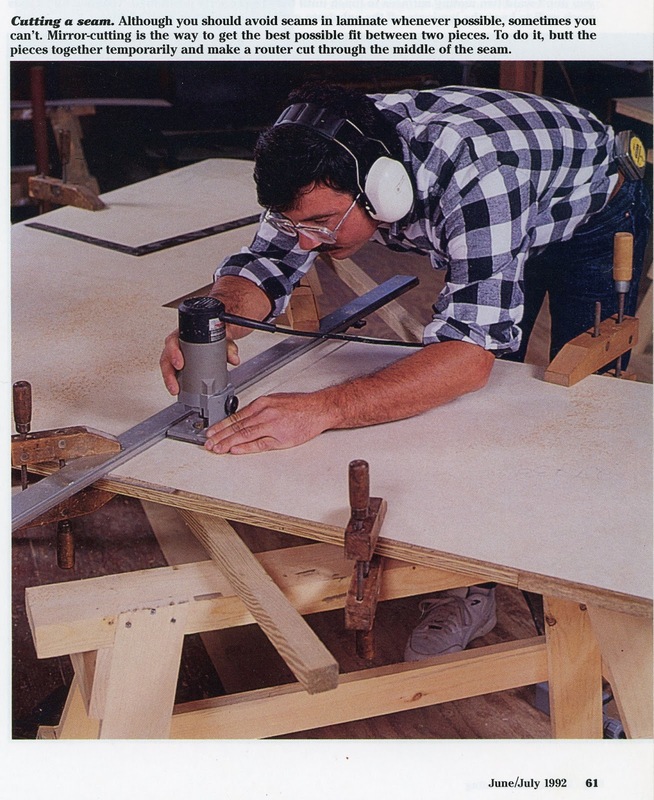 This reminds me of your book about making my own kitchen countertops. My kitchen still has those countertops built from your book. The best and only book on the subject. My countertops are rock solid. I am also still enjoying all my fresh garlic and garlic powder. Just made 3lbs of garlic powder this week. My house smells like a Italian restaurant. Thank you so much for sharing your knowledge. You would be a very long time reader of my writings if you got that book any time around when it first came out. Thank you for the compliments. I'm pleased to know that book helped you. And three pounds of garlic powder is a seriously good amount.